Heat oil in a medium saucepan and sauté the onion for 2 to 3 minutes. Add the drained millet and sauté for another 3 to 5 minutes. Add the squash and water, cover and bring to a boil. Reduce the flame to medium-low and simmer for 30 minutes. Remove the cover and turn the flame to low. Place the miso in a small cup and add 2 tablespoonful of water. Mix and add the dissolved miso to the millet, mix thoroughly and simmer 1 to 2 minutes. 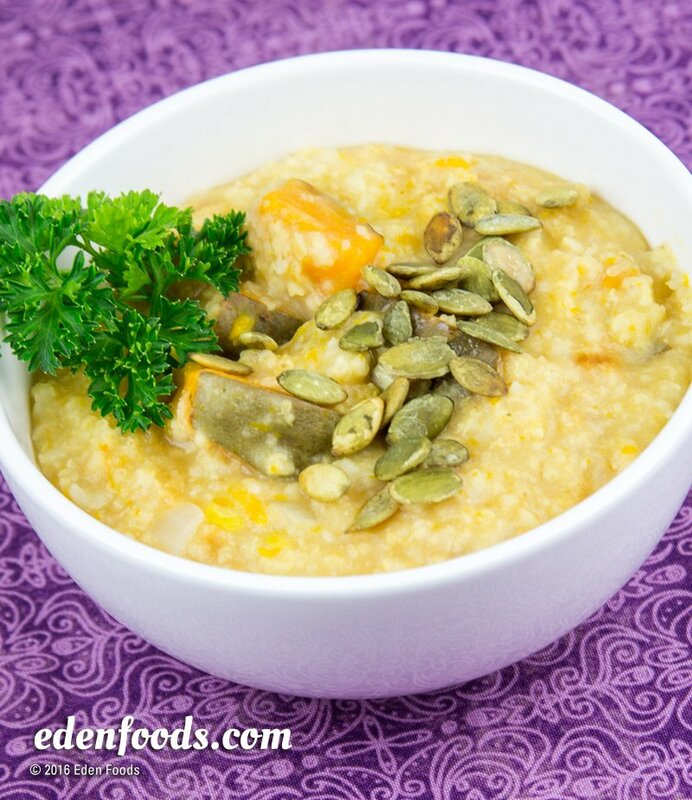 Place in serving bowls and garnish each bowl with Eden Gomasio, Eden Shake or Pumpkin Seeds and parsley before serving.